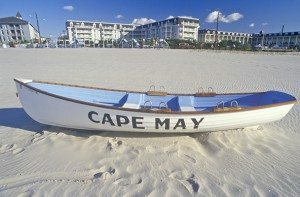 Spend your summer on the Jersey Shore in the beautiful area of Cape May! Campers who stay at Big Timber Lake RV Resort love to visit the popular local beaches located just minutes away. With sights, shipwrecks, and plenty of activities, they’re the perfect summer playground for vacationing families. When it’s time for the sun to make its nightly descent over the horizon, Sunset Beach is a wonderful place to be. Spot the remains of the shipwrecked SS Atlantus and visit the seashore shops before settling down to view the beach’s namesake. Broad swatches of red, orange, and gold paint the sky in a breathtaking show that reflects across the water. Against the backdrop of this beauty, the beach hosts a flag-lowering ceremony every night. As Old Glory is gently brought down, you can hear Kate Smith’s God Bless America and taps. Plan to be at the beach an hour before sunset to be sure you won’t miss this unforgettable and moving experience. The beaches in Cape May are clean, quiet, and uncrowded. For a small fee, guests can spend the day relaxing amid the tranquil expanse of sand and waves. Lifeguards are on duty until 5:30 p.m. and plenty of restrooms are available. Bring along a cooler for a seaside picnic, or try one of the local restaurants, which range from fine dining at The Blue Rose Inn to simple Greek food at George’s Place. Nestled in the New Jersey pines, Big Timber Lake is close to all the attractions of Cape May. Take a trip to Avalon Beach for a day in the sun or head five minutes away to the Cape May County Park & Zoo where you can spot lions, zebras, and bears among the animals. Even with great local attractions, you may not want to leave this resort. Activities for all ages are available, including miniature golf, basketball, volleyball, and arcade. Cool off in the crystal-clear pool or head down to one of the two lakes, where you’ll find sandy beaches, plenty of fishing, and an inflatable challenge track. For more adventure, try out our aerial adventure park where you’ll be challenged on rope courses, and rewarded with a zip line flight over our gorgeous lake. Don’t fret about dinner! You can get a meal at The Pine Cone Café, our on-site restaurant and ice cream shop that offers juicy burgers, creamy milkshakes, and made-to-order omelets. For snacks and supplies, head to our convenience store, which has everything you need for a great stay. Tickets for the miniature golf course and aerial adventure park can also be conveniently purchased at the store as well. Whether you’re exploring the beaches or hiking the forests, there’s something for everyone in Cape May!